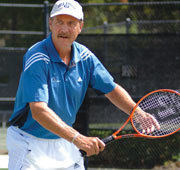 HiltonHeadIsland.com » Events » Stan Smith Super Series! November 22-24: Stan Smith Super Series! Join Stan Smith-past champion of Wimbledon and the U.S. Open, a member of seven winning U.S. Davis Cup teams and former U.S. Olympic men’s tennis coach-and his staff for this fun-filled weekend. The nine-hour class will feature video analysis of your serve, stroke and strategy instruction, footwork and many practice drills. Thursday, Friday and Saturday 9 a.m.-12 p.m. For registration and additional information, please call (843) 363-4495. At hiltonheadisland.com, we're passionate about this one-of-a-kind barrier isle hugging the South Carolina coast and love sharing the best of the Lowcountry with visitors from near and far.